At AnimSchool, characters aren’t just a tool. They’re a main focus! Griffon is one of our advanced game rigs, with face controls. 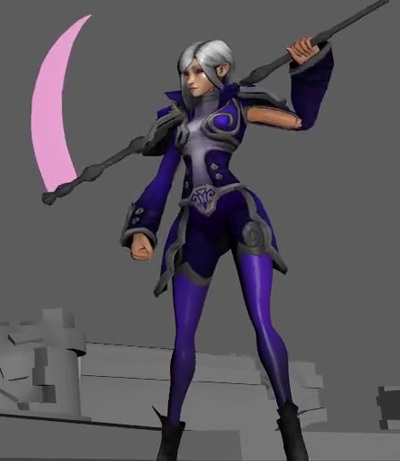 Game animation students use the enchanting Sorceress in the upper game classes. Sorceress was designed by Jordan Kerbow. Rock is a great game character rig, capable of crushing good guys but just as likely to fall apart into rock pieces. Elwood was our first game animation character! 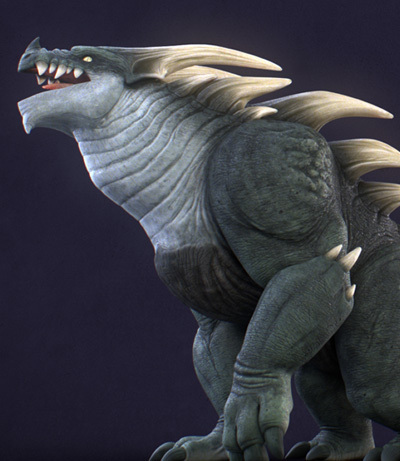 Our second game class unlocks Hellhound, a creature you may not want to run into. The Malcolm mod used in student Xin Zhao and Florent Rubio's amazing short The Answer! DemonSorceress mod made by graduate Eric Bellomy! Students in our game animation classes can learn using Riker. Riker was designed by artist Wesley Tippetts. Marco is AnimSchool's new pretty-boy character rig. He has two complete outfit changes and two hairstyles to choose from. Marco represents a new initiative with more detailed texturing taking advantage of Maya's Viewport 2.0 stingray materials display. 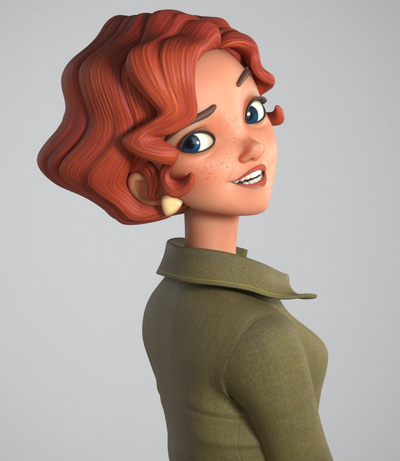 Marina is AnimSchool's new gorgeous female character. Marina is part of a new initiative with more detailed texturing taking advantage of Maya's Viewport 2.0 stingray materials display. Burcak (pronounced "Burchak") is made using an all new rig initiative - we've taken the extreme facial expressiveness AnimSchool is known for and brought it to the game rig world! Burcak has a wide range of expressions not usually seen in games. He has beautiful detailed texturing displayed using Maya's Stingray shaders. Burcak was designed by artist Dusko Bjeljac, modeled and textured by AnimSchool graduate Pablo Bellozas, and rigged by AnimSchool founder Dave Gallagher. Giacomo is our advanced animation students' choice for older character roles. Giacomo was built with each part and control being tested to extreme levels, making the strongest poses possible. 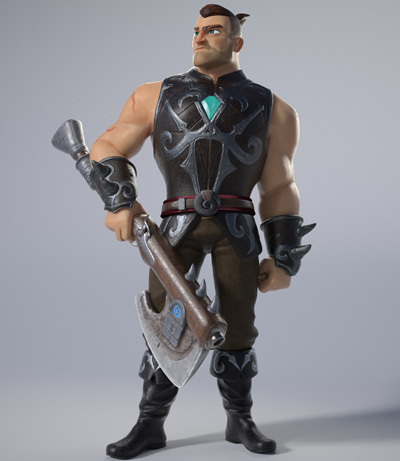 Giacomo was designed by famous animation veteran Sergio Pablos of The SPA Studios, and modeled by AnimSchool students Marcus Ng and Pablo Bellozas. Maggie is our adorable little girl rig. She is a new favorite for AnimSchool students. You can't say no to face like that. 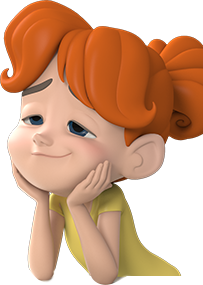 Maggie was designed by AnimSchool founder Dave Gallagher and Disney animator Amanda Zima. Marshall is great when our students need a rounder profile. Marshall has clothing options: shirt, jacket, pants, shoes, poseable toes, as well as fat controls. Marshall was designed by Disney animator Boris Maras. Marshall Nacho is a "mod" of the original Marshall Rig. Ignacio is a super flexible iguana character, especially good for comedic shots. 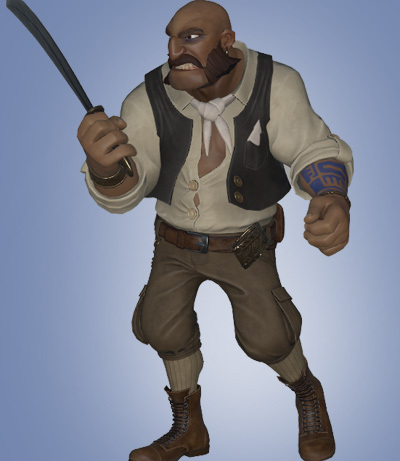 Ignacio was designed by Disney veteran Tom Bancroft. AnimSchool's world-renowned flagship rig has dozens of wardrobe and hair options. Our free Malcolm character and AnimSchool Picker have been downloaded by over 35,000 users. It's like dozens of rigs in one. Marnie is a gorgeous female rig -- sure to attract any male 3D character in sight! Sleek and sophisticated, Marnie has retro charm and good looks! Marnie 2.0 has mix and match outfits. Using AnimSchool Picker, students can turn on and off entire costumes or individual parts. You can even make her barefoot, since she has poseable toes. Marnie was designed by AnimSchool founder Dave Gallagher. Mikey is a film-quality boy rig AnimSchool students can use alone or with the Maggie little girl rig. Mikey was designed by the talented Alessandro Toccaceli. 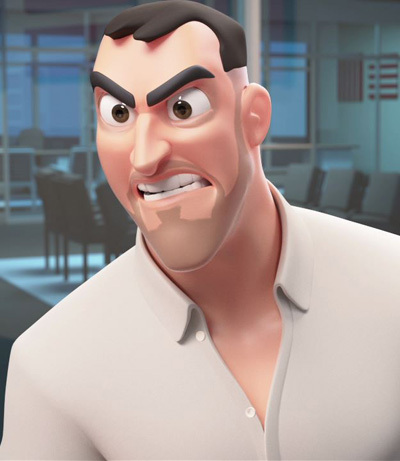 Coach is our top-heavy muscle-bound character rig, with an advanced, flexible facial rig. Using the most refined, advanced characters allows AnimSchool student work to stand out among competitors. Coach has clothing options: shirt, collar, cleats, shoes, pants or gym shorts. Coach was designed by AnimSchool founder Dave Gallagher and Disney animator Boris Maras. Scout is AnimSchool's advanced dog rig. Scout is not just for learning quadruped animation-- he has a very detailed facial rig. Scout was painstakingly developed to reach artfully designed poses, and allow for a myriad of variations in expression. 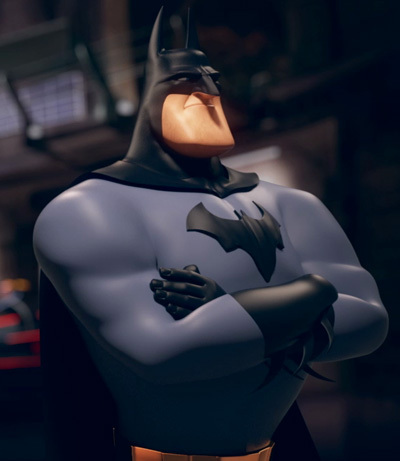 AnimSchool's Coach rig, transformed into a Batman-type character. This great mod was made by AnimSchool graduate Maxmiliano Schneider. Student Malcolm Robin mod by Maxmiliano Schneider! Grave is one of our new Visual Effects creature rigs! 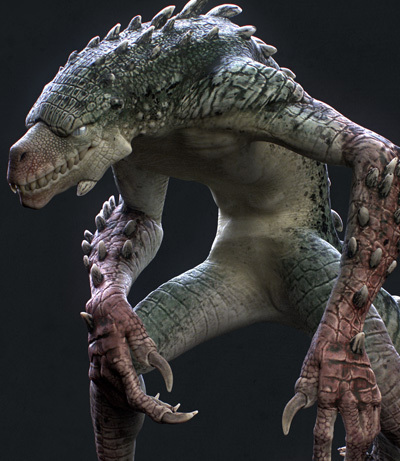 Towerback is one of our new Visual Effects creature rigs! Block is one of our flagship simple rigs. Students use these segmented rigs to learn body mechanics so each posing decision is explicit, without being obscured by deformations. One of AnimSchool's very first rigs, it's BoneApart! Students use him whenever a cartoony skeleton is needed. AsianMalcolm is a great Malcolm mod from contributor Cody Lyon. Grave Rig for Games Animation Classes! Towerback Rig for Games Animation Classes! We started AnimSchool because we love appealing characters! AnimSchool characters and AnimSchool Picker are used worldwide by over 35,000 enthusiasts and professionals. AnimSchool's Malcolm rig has been used to win numerous awards and in thousands of personal and commercial productions. Since the founding of AnimSchool, our characters have been used worldwide and have a reputation for flexibility and appeal. 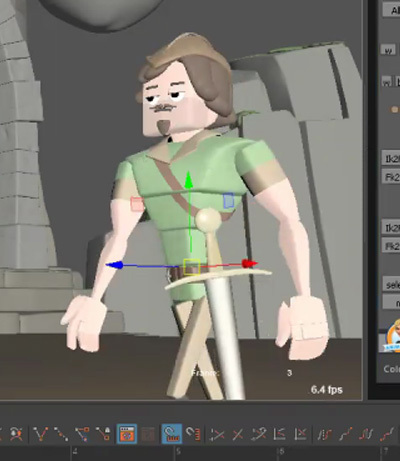 Animators love animating with fun, flexible character rigs. We love seeing characters come to life! Character artists learn to model great appealing shapes and topologies that deform well. Then how to hand-craft rigs that invite a solid performance. Whether students enroll into the 3D Character or the 3D Animation program, they will appreciate our commitment to characters. We teach people how to make great characters. We teach how to make them act convincingly. We’re focused on appeal. AnimSchool CEO Dave Gallagher said "Growing up, I was enthralled with the characters in movies like Jungle Book and 101 Dalmatians. Some of the Warner Bros. shorts were just as inspiring to me! To me, those 2D characters with their expressivity, stunning character design, and personality are highwater marks. Even though in 3D animation we can refine the acting like never before, it’s so rare to find 3D characters that come close to being that expressive and beautiful. This is what drives me and excites me in this field! 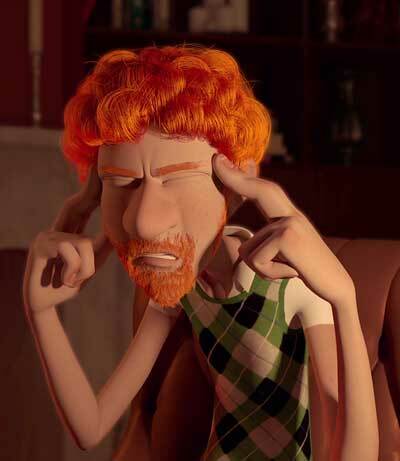 Now I want to bring those sensibilities to students all across the world here at AnimSchool." 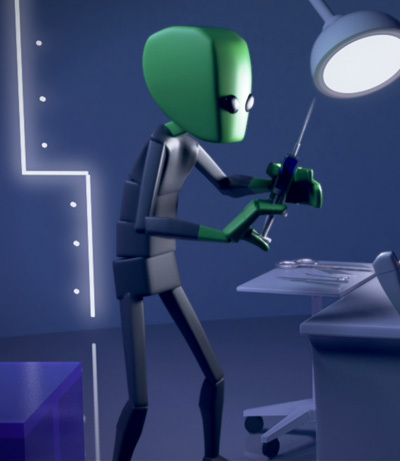 Pixar animator Michal Makarewicz said "I love AnimSchool rigs. The reason I use them is it's closest to the stuff I use professionally. I like the way they work... friendly." "The first important thing for me is the model, the design and appeal. Malcolm looks good, his design is simple, but with potential- I like that. The rig is very complete, the facial rig is superb and powerful." "I would like to thank AnimSchool for making such an awesome rig available for public use. I really love Malcolm’s design and his overall flexibility. He can be pushed and pulled further than any other rig that I have used. His facial setup is awesome; it's really easy to get appealing shapes and expressions. Because of the nature of the competition’s dialogue, I didn’t get to utilize the rig to its full potential, but for my shot, the IK elbow pinning and the IK/FK switching came in very handy." "Malcolm is the best rig I have ever worked with! (And I’m not only saying this because I won with Malcolm) Until now, I have always thought that there are no bad rigs, just weak animators, but I have found out, it is crucially important how much latitude a rig can give to the animator. At first I got frightened by seeing the amount of controllers, but with a little practice, it can easily be seen which controller should be used to which action. It was a great help that I could change body position by moving the hip or the abdomen, and the shoulders kept their position at the same time. I loved that I could handle the arms in arch and that I could stretch the character. These are very important factors on a rig for a nice cartoony animation."